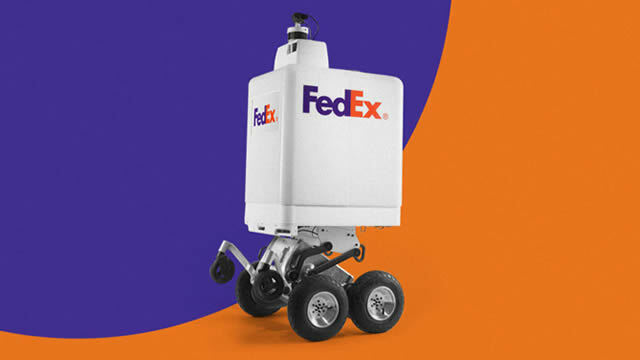 Delivery giant FedEx is getting in on the robot delivery wars, debuting a robot called SameDay in the USA that can climb stairs and navigate sidewalks. Their SameDay bot is designed to seem friendly to humans in its own way. In fact, its design looks almost comical, with four chunky wheels and two small auxiliary wheels that look like little T-Rex hands. Those hands aren’t there for decoration; the robot uses them to climb stairs and navigate any vertical obstacles it may encounter on its path. It’s a system that was developed with the help of Dean Kamen, the inventor of the Segway and the stair-climbing wheelchair. The bot stores packages inside its hefty body, accessible via motorized doors, and LIDAR sensors in its “head” help it navigate the world with its electricity-powered traction system. Two screens, one on the back and one on the front, help it communicate with messages like “hello.” The back screen is used to indicate what the robot is about to do to anyone who is following it, with icons that indicate it’s about to turn right or stop to deliver a package. FedEx wants to position its robot as the equivalent to a neighbourhood delivery boy, working with retail partners to set up a delivery system. “On average, more than 60% of merchants’ customers live within three miles of a store location, demonstrating the opportunity for on-demand, hyper-local delivery,” the company says in a press release. FedEx says it will refine the prototype, and then begin deployment as soon as the company’s engineers are satisfied with its performance. It’s unclear how long that will take, but FedEx announced that its first retail partners will include Pizza Hut, AutoZone, and others. The race to deliver your pizza with a robot is heating up!